Hugo loves to be involved, it doesn’t matter what we’re doing; it could be gardening, vacuuming or grocery shopping -he just loves it. 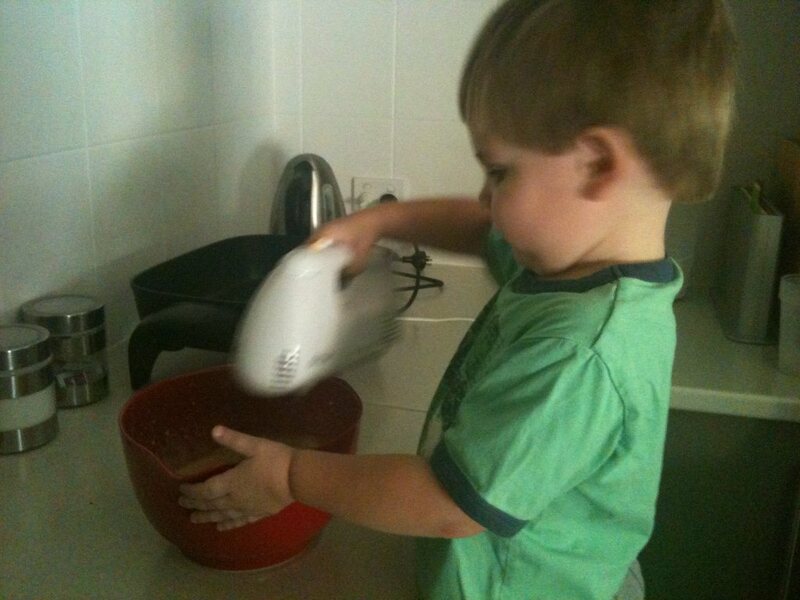 One of his new favourite things to do is help Claire when she is cooking or baking. We need only say the word ‘cooking’ and Hugo will go and drag one of the dining room chairs over to the bench and stand up in anticipation! So far Hugo has helped with pikelets and chocolate chip biscuits. He has learned a few skills of the trade as well, he can help crack eggs, is great at holding measuring spoons, knows how to ‘tap’ measuring spoons and cups to empty them out, can stir with a wooden spoon but most of all he loves to use the electric beater. Like any good cook, he also appreciates tasting throughout the whole process!